"The hunger had become unbearable; I was willing to risk my life for the promise of a bowl of rice." I think any memoir that is as raw and straightforward as this one deserves the full 5 star rating. I actually felt myself starting to get a little bit teary in some parts. Even the acknowledgments section at the back of the book was so sincerely written that I was emotionally moved! "I know that it is possible to lose part of your humanity in order to survive. But I also know that the spark of human dignity is never completely extinguished, and that given the oxygen of freedom and the power of love, it can grow again." To be clear, this is the first story about North Korea that I have ever read. The publication of memoirs of North Korean defectors, especially women, seems to be a new trend the last couple of years. To my knowledge, they existed before in Korean media, but none really were well-known in the English speaking world until recently. Anyway, given what I do know about the culture, everything she discusses seems very accurate; I don't have the impression that she lied or concealed anything more than identifying names/traits to protect identities of people who might be hunted down by the North Korean government. "But in a place without an Internet or an outside newspaper, it was impossible to get reliable information. If you asked too many questions, you could be reported." Most chilling bit: when she explains how reading Orwell's 1984 crystallized in her mind exactly how corrupted the way of thinking encouraged in North Korea was. 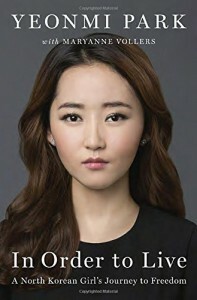 Most touching bit: when her grandmother asks that she come to her grave someday to tell her that North and South Korea was a united country again, shortly before Yeonmi describes, from her young self's perspective, how her grandmother commits suicide to avoid being a burden on their impoverished family. -- "When you have so little, just the smallest things can make you happy - and that is one of the very few features of life in North Korea that I actually miss." I noted this because one would be hard pressed to find any outsider to think there might be actually something good about North Korea given our prejudiced and uninformed knowledge. -- "If you grow up in the West, you may think that romance occurs naturally, but it does not. You learn how to be romantic from books and movies, or from observation." Nature vs. Nurture argument? Also, the difference between romance and sexual attraction. -- "[My mother] carries guilt to this day that she was not better able to enjoy my childhood; she was too busy worrying about getting us enough food to eat." I think this sentiment could be applied across culture and country to any mother who has dealt with the circumstances of raising a family in hard times, especially as a single mother, whether by choice or chance. -- "Jang Jin Sung, a famous North Korea defector and former poet laureate who worked in North Korea's propaganda bureau, calls this phenomenon 'emotional dictatorship.' In North Korea, it's not enough for the government to control where you go, what you learn, where you work, and what you say. They need to control you through your emotions, making you a slave to the state by destroying your individuality, and your ability to react to situations based on your own experience of the world." This is probably the truth in most 'free countries' fears... See the Red Scare? -- "I think it's because people are so oppressed in North Korea, and daily life is so grim and colorless, that people are desperate for any kind of escape. When you watch a movie, your imagination can carry you away for two whole hours. You come back refreshed, your struggles temporarily forgotten." The exact reasoning behind the massive entertainment industry which feeds into inflated salaries for everyone at the top of that food chain; and many, many classic sci-fi novels. "There were so many desperate people on the streets crying for help that you had to shut off your heart or the pain would be too much. After a while you can't care anymore. And that is what hell is like." -- "After I escaped to South Korea, I was surprised to hear that the blossoms and green shoots of spring symbolize life and renewals in other parts of the world. In North Korea, spring is the season of death. It is the time of year when our stores of food are gone, but the farms produce nothing to eat because new crops are just being planted. Spring is when most people died of starvation. My sister and I often heard the adults who saw dead bodies on the street make clucking noises and say, "It's too bad they couldn't hold on until summer." -- "There were times when I wondered whether, if it wasn't for the constant hunger, I would be better off in North Korea, where all my thinking and all my choices were taken care of for me." I am very curious about this one. At this point in the story, I wonder if it was motivated more by a desire for what was familiar, or easier, or... what?